HOUSTON -- President George H.W. 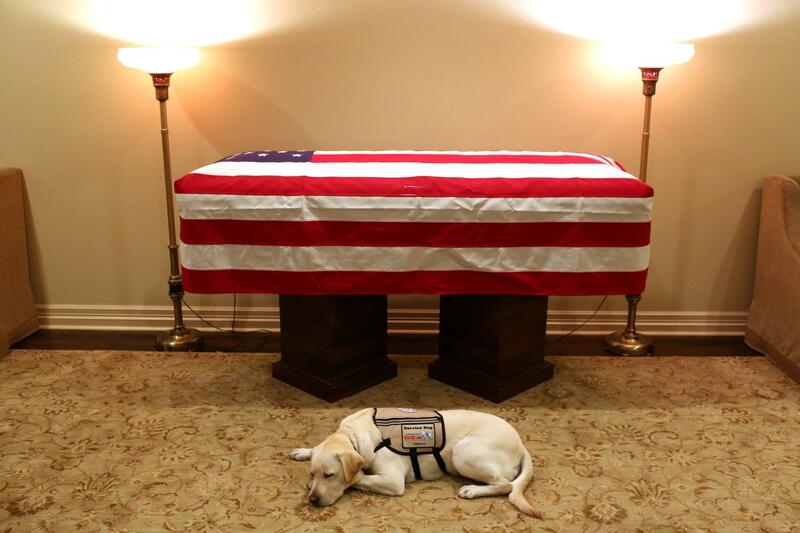 Bush's spokesman has posted a photo of the late president's service dog lying in front of a flag-draped casket. Jim McGrath tweeted a picture Sunday of the yellow Labrador retriever named Sully with the caption, "Mission complete. #Remembering41." The nation's 41st president died Friday at his home in Houston at 94. He will be honored during several public and private events in Houston and Washington before his burial Thursday in Texas. Bush received Sully in June from America's VetDogs nonprofit organization. The president had a form of Parkinson's disease, and Sully could open doors, pick up items and summon help. KTRK-TV in Houston reports Sully will return to America's VetDogs in New York through the holiday season before joining the Walter Reed National Military Medical Center's Facility Dog Program.